both numbers in the house number tag, separated by comma: 4,6 for example. > only one node. However, what should I do for the second error? > may look "messy" on the map. What is the preferred strategy? 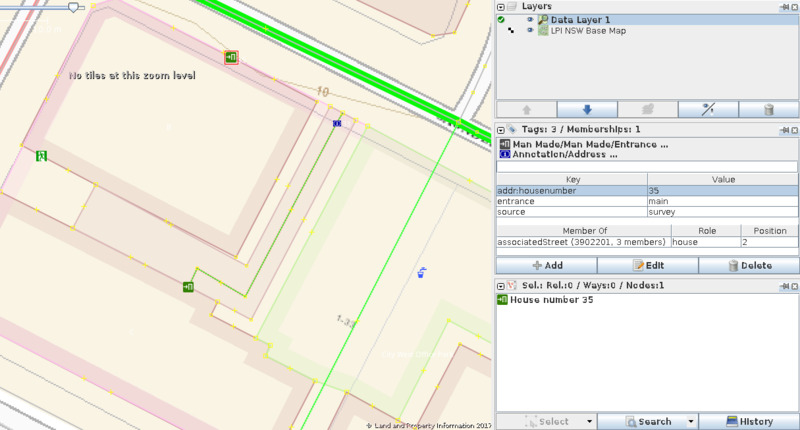 >> Good idea with the JOSM mapstyle! >> ahead and do the importing, no need to ask here every time. >>     and move to a different area to import addresses! >>>     a number of similar issues around the same area. >>>     housenumber 3 but shows up as 61 in your proposed import. >>>         to overwrite it and so I don't add a node. >>>         99% of the way there, and minimise false positives. >>>         about half an hour of human time. >>>         smoothly I will upload this, and do a larger area. >>>         (because Github is proprietary). >>>         judgement on a small case by case of exactly what to do. >>>         and post it on talk-au for regular review and local QA. >>>         the wiki this weekend, along with some data to review. >>>         > > Overall I'm okay with the approach you've outlined. >>>         who is checking the history to know how this data was gotten. >>>         job at collating that. >>>         find it doesn't represent what's on the ground. >>>         > > > Good morning all! >>>         part of a building. >>>         interpret the base map background, and then tag it as necessary. >>>         the property, not randomly to the mapper's liking. >>>         this area based off local knowledge. >>>         > > > Looking forward to your comments!